Inbound marketing is complicated. 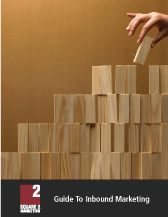 You need three distinct phases — plan, build and grow — to generate leads and business results. 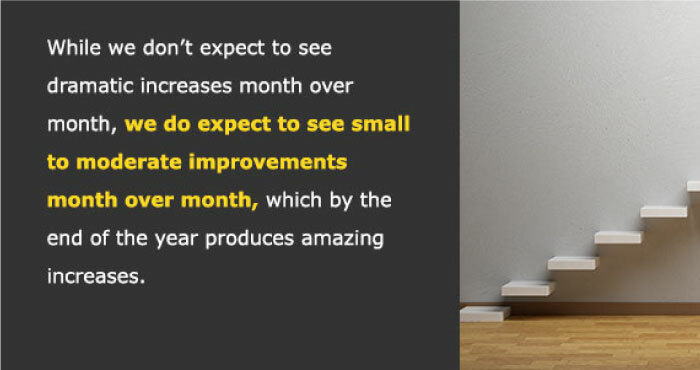 When we see inbound marketing programs that are underperforming, something is usually missing. More often than not, what’s missing is the strategy and planning behind the tactics and the process to continuously improve the program once all the assets are set up and operating. Because of these habitually missing elements, you need to very deliberately make sure that your inbound marketing effort has the three critical phases: strategy and plan, implementation and build, and finally optimize and grow. Skip any of these phases or take shortcuts to fast-track any elements and you run the risk of impacting program performance negatively. In other words, you’ll get less leads than you expected. Finally, it’s a requirement for your inbound marketing tactics to be seamlessly integrated, or more specifically, orchestrated. This means you’ve leveraged your search strategy to build a website that gets found. You’ve created content with the buyer journey in mind so people convert into leads, and you’re promoting content across a variety of tactics to apply a multiplier effect that only comes from well-planned-out and constructed inbound marketing programs. Think like an orchestra. You have amazing musicians, but if they play their own music the total sound is horrible. Once they’re organized and led by the conductor, they produce the most beautiful music. Inbound marketing needs to be orchestrated to produce amazing results. During the plan phase you’re creating the target persona profiles, marketing messaging, differentiation, stories and analytics required to measure program performance against expectations. This is by far one of the most important exercises within an inbound marketing effort. But first you need to understand why the plan phase is so critical. Think about it like a recipe for a cake. If I said to you “here are the ingredients for an amazing chocolate cake” without providing the recipe, you might make a great cake, but more than likely you’d end up with a mess. You need a plan, and that plan needs to align perfectly with your business goals. During the build phase you're creating all the assets you need to generate leads, including the website, content, email, social content, lead nurturing, search engine optimization, influencer marketing and the technology stack required to effectively manage and automate as much as possible. Now that your strategy and planning is complete, you have a schematic on exactly what needs to be built, how it needs to be built and when it needs to be built. Here's an example: You want a new website, but you want your website to be found when people search for targeted keywords, phrases or questions. This is why you did search strategy before you started building your website. You want to make sure your website has pages, offers and content for each of your personas at each stage of a buyer journey. This is why you did persona and content strategy work prior to starting the website. You want your website to be a lead generation tool for sales. That's why you thought through how you're going to convert visitors into leads when they land on your site. Without the strategy phase, you'd be making assumptions and decisions without context to the rest of the inbound program. If you have aggressive lead generation goals, you're going to need a lot of active marketing and a lot of tactics to drive visitors to your site and then convert them to leads. If you have a less aggressive requirement, then you can get away with fewer tactics and a lower level of investment. It all comes down to your goals. However, you're going to need three sets of tactics in your program. You're going to need tactics that help you get found, tactics that help you convert visitors to leads and then tactics to nurture those leads. All these tactics have one common characteristic; they drive new visitors to your website by helping you be in the places that your prospects are spending their time on the web. If you look at on-site SEO, this effort helps your website come up in searches on Google, Yahoo and Bing. On-site SEO includes website architecture, website copy, blogging and using proper search engine optimization methodology in the deployment of web-related assets. Off-site SEO includes using other websites to drive visitors to your website. For example, if you write a blog and a reader likes it, they might put a link in their blog back to your blog. That backlink drives new visitors to your site. Social media is another source of new visitors. If you have a great presence on LinkedIn, Facebook or Twitter, that's going to result in people wanting to learn more about your company and coming to your site for more information. All these tactics have to work seamlessly to produce the best results. The better these are planned and orchestrated, the more visitors you'll get to your site and the richer the very top of your marketing funnel. But getting found is only the first step in a series of complicated steps. Next you have to turn that anonymous visitor into a lead, or someone who has shared their contact information with you in exchange for something of value from you. Knowing how to convert visitors is a process that takes time and experience. Make sure your offers are targeted to your personas and answer the questions we discussed in the plan phases. Take extra time to create bottom-of-the-funnel offers that deliver real value. "Contact us," "take a demo" and "get a free trial/consultation" are unremarkable and ineffective bottom-of-the-funnel offers. The more you create new offers, the more leads you're going to generate, so look back at your plan and make sure you have enough offers planned to drive the amount of leads you need to grow your company. Now that you have leads, those people are still probably not ready to buy. 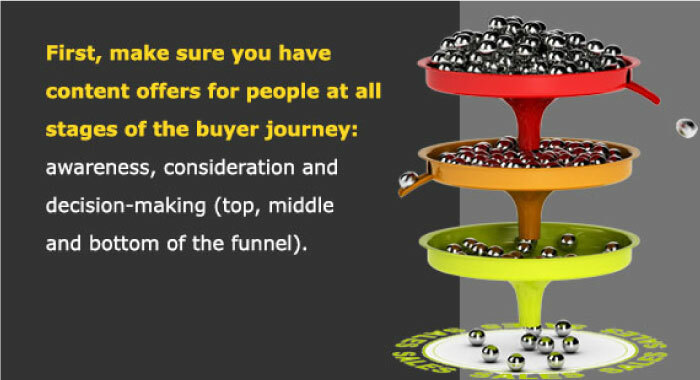 Typically, 90% of the leads are at the top or middle of the funnel, which means they need more time and more information before they’re ready to buy. This means you need to nurture those leads. Leads often get nurtured via email marketing campaigns, and an inbound marketing program usually has two types of email marketing tactics. The first is what we call educational emails that go out regularly (once or twice a month) to everyone, including prospects and maybe even clients or customers. These are helpful, educational emails that share tips, advice, industry insights or case studies about other clients. The other type of email campaign is designed around specific actions prospects take on your website. If they download a specific whitepaper, a series of three to six emails automatically goes out to help you stay connected with that new lead. If they sign up for your blog, three to six different automated emails might go to that prospect. Together, these different types of tactics are organized to deliver similar messages, stay close to these new prospects and create an experience that advises, guides and educates your prospects. People make purchase decisions when they feel safe. 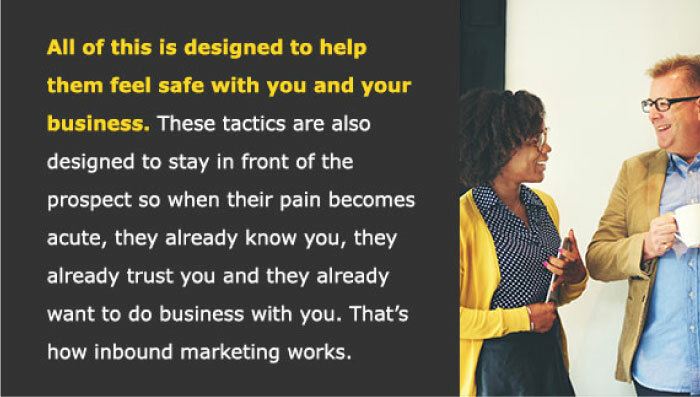 They make purchase decisions when they know, like and trust who they’re going to work with, and they make purchase decisions when their pain becomes acute. Once that’s done, you move into the grow phase, where you need a methodology to continuously test and improve performance week over week and month over month. Inbound marketing is a continuous improvement approach to marketing. Since it provides real-time data on the performance of every single tactic, it’s easy to get data, make decisions, test your decisions and see the results. We call this optimization, and it’s one of the secrets to great results. In order to execute this, you need to have a scientific approach to marketing. You need to be willing to test everything and be willing to suspend opinions and assumptions in exchange for facts and data. You also need methodology. At Square 2 Marketing, we use analyze, review, respond and act to collect the data, review it with the team, come up with an action plan based on the data, and then implement the changes and measure the improvements. This produces program improvements month over month. The ability to look at data from your program, analyze that data and know how to respond with an action plan takes time. It takes expertise and it takes process. If you don’t feel like your internal team has the ability to execute the grow phase, working with an agency that does this religiously for all its clients is a great option.